Brilliant Yes songs recorded in the 70s. I found this website and this particular page a few days ago by accident whilst surfing the net. I WAS THERE AND I'VE STILL GOT MY TICKET STUB. As today (January 18 2003) is the Thirty-Second Anniversary of this concert I thought I'd share my memories of the gig, I can't remember all of the songs but the memory of the event will live with me for ever. 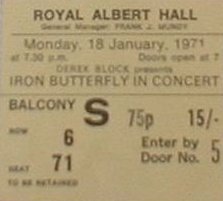 Four of us travelled from Clacton-On-Sea in Essex to see the gig, by van to Wanstead Underground Station and then Tube to Albert's Emporium - we missed DADA but arrived in time for YES and IRON BUTTERFLY. My first thoughts were 'WOW!!! An all Fender back line and look at the size of those Bass Bins' (made by RCA I think) but my attention was soon diverted to the stage when YES began their set with a staggering version of "Yours Is No Disgrace" and I was hooked. "I've Seen All Good People" and "The Clap" were stunning and I'm embarrassed to admit that's the only tracks I can put names to. Suffice to say I was on my feet yelling for more at the end of what I can only describe as a Master Class. Paul Simon's "America" was transformed into a mini opera with almost every musical style making an appearance. And a song called "It's Love" which I believe is one of Chris Squire's compositions. The evening finished with members of DADA, YES and IRON BUTTERFLY all on stage together, definitely a memorable evening. IRON BUTTERFLY were good, particularly "Easy Rider (Let The Wind Pay The Way)" and the anthemic "In A Gadda Da Vida", but to be honest YES Showed them the way to do it. I haven't been to The Royal Albert Hall since this gig, and I only saw YES live once more with Patrick Moraz on keyboards and Alan White on Drums - and unforunately It didn't work for me. The Anderson, Howe, Squire, Kaye, Bruford line up was the definitive YES as far as I'm concerned and I didn't really like anything else until "Owner Of A Lonely Heart".